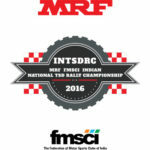 The MRF FMSCI Indian National TSD Rally Championship (INTSDRC) is the premier TSD rallying series in India run under the aegis of the Federation of Motor Sports Clubs of India (FMSCI), which is the Governing Body or ASN of India recognized by the FIA, culminating with the Indian National TSD Rally Champion Driver, Co-Driver and Team. The championship is based on a zone qualification system leading to a National Final. The championship first received its National Championship title status in 2012. Indian drivers in Indian cars are eligible to take part in the 2016 INTSDRC.